Virginia Gov. 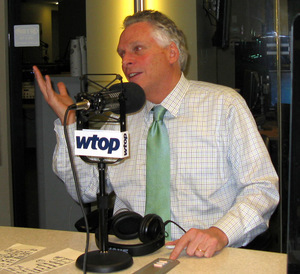 Terry McAuliffe joined WTOP live Wednesday, Jan. 27, 2016 for "Ask the Governor." WASHINGTON — While giving traffic reports on his way to WTOP, Gov. Terry McAuliffe praised Virginia's response to the weekend's historic snowstorm and said that additional equipment wouldn't have made much difference. "We didn't shut any of our highways down. I know Maryland did for a short time ... we kept them open," he said. McAuliffe said that interstates across the state were cleared of snow and traffic was moving on Sunday. "I feel pretty good ... We've hit them hard," he said. "Every road now has had a pass by us I believe." McAuliffe spoke by phone with WTOP for part of "Ask the Governor" Wednesday before taking a seat inside the Glass Enclosed Nerve Center. It took an hour to travel from Capitol Hill to WTOP in Glover Park. "Trying to come through the city though, it is just gridlock," he said. Commuters throughout the region experienced a similarly atrocious morning as many roads still had just one lane available. Construction and snow removal equipment blocked lanes on major commuter routes. Many workers ventured to their jobs for the first time this week adding to the volume on roads not able to handle the typical rush hour crush of cars. Loudoun County — where more than 3 feet of snow fell in some areas — has canceled school for the rest of the week and many other communities have yet to reopen school as the region struggles to recover. A caller from Burke asked why plows would plow the same stretch of cleared pavement over and over again instead of moving on to snow-covered roads nearby. McAuliffe said he would address that with his transportation secretary. "I want to bring efficiencies. And if they're going back 12 times over same road does not make sense to me," he said. McAuliffe said the state has spent about $175 million since Wednesday to prepare for and respond to the storm, which left no part of the state untouched. It could end up being the state's most expensive storm, especially if road and contracted crews continue removing snow through Friday. About 13,000 pieces of equipment and 9,500 workers were deployed throughout Virginia and 50 crews from Connecticut came in to help clean up all the snow. In Northern Virginia, the Virginia Department of Transportation aimed to have cleared a path through subdivisions by 6 a.m. Typically, homeowners associations are responsible for snow removal within subdivisions. But the heavy wall of snow required large plows and construction equipment and in many cases will need to be hauled away in dump trucks. "You can't just push it. At some point you've got to start picking it up and moving it," McAuliffe said. The governor defended his secretary of commerce's acceptance of box tickets to a Redskins playoff game, which raised questions whether that violated McAuliffe's self-imposed $100 gift cap. "(Maurice Jones) was there on behalf of the commonwealth," McAuliffe said. McAuliffe said there are "active negotiations" as the Redskins consider whether to leave FedEx Field. Virginia, Maryland and D.C. are all actively vying to be selected as the team's new home should there be a new stadium. Maryland Gov. Larry Hogan and D.C. Mayor Muriel Bowser also attended the game. All were invited by the team, he said. "I'm trying to win that stadium here in Virginia. (Jones) was up there doing economic development." The governor signed an executive order shortly after taking office limiting the value of gifts to himself, his family and his staff. A new state law imposes similar limits on legislators. Virginia Supreme Court Justice Jane Roush would not likely return to her old job as a judge in Fairfax County if she were removed from the state bench, McAuliffe said. Roush fell victim to a political fight over redrawing congressional district maps last summer. McAuliffe has appointed her twice to fill an open slot on the court. But the Republican-controlled legislature has the final say and Republican leaders have nominated Judge Rossie Alston, of Manassas, for the spot. GOP lawmakers have said that McAuliffe didn't communicate with them effectively about his pick to the court. They also quibbled over whether or not the General Assembly was in or out of session. In Virginia, governors can make interim court appointments when the legislature is not in session. Members of the House of Delegates' courts committee were scheduled to interview both Roush and Alston Wednesday afternoon. But McAuliffe said it won't be a realistic job interview and called it sad politics. "They've kicked her to the curb. What a great way to treat a great justice who has done nothing but be an exemplary judge for 20 years here in Virginia. It is a disgrace," he said. Roush presided over the trial of D.C. sniper Lee Boyd Malvo and was set to hear Charles Severance's triple murder trial until McAuliffe appointed her to the state's high court in Richmond. Big buildings with seats, that's how McAuliffe describes high schools. He says modern high schools, built for the Industrial Revolution, need to adapt to meet the needs of the technological revolution. He wants core classes to be taught earlier to give high school students time to gain specialty training through credentialing courses or apprenticeships. He also would like students to decide sooner what career they will pursue instead of waiting until their junior or senior year, McAuliffe said. "That's building a workforce of the future," he said. McAuliffe has recommended adding an extra $1 billion toward public education to make up for funding lost since budget cuts were put in place during the height of the recession. He also wants to add 2,500 instructional staff or teachers throughout the state and give teachers a raise. McAuliffe has also suggested borrowing $800 million for higher education and another $200 million for community colleges. Legislators will craft their own version of the budget in the coming weeks. That's it for this month. Thanks to all for joining us. The full audio and a story will be posted shortly. @WTOP Please have courage to ask my questions! @JamesMontfort1 Gitmo Terrorists and ISIS camps are here is Virginia!!! What is plan? @WTOP #askthegovernor what are some lessons that Maryland and DC can learn from Virginia, and vice versa? On his drive here: Next time I'm bringing a plow with me. Gov: Education is the key to building a new economy. I can bring businesses back but I've got to guarantee that we've got the workforce. On high schools - right now they are big buildings with seats. He wants students to take core classes sooner in high school, not wait until junior or senior year so that student can earn credentials, take apprenticeships and be prepared for the jobs that are out there today. High schools today are based on a model that dates to the Industrial Revolution. Gov: Yes, lost ground on ed funding since budget cuts during the recession. He's recommended adding a $1 billion in the budget for ed. But he wants to invest it "strategically." Wants to transform high school, invest in community college, research and development. Answering question about out-of-state conceal carry permits: Many states don't have the requirements that we have - barring those with mental illness, illegal aliens from purchasing guns. The attorney general is enforcing the law that the General Assembly has already passed. We'll see if those other states in turn reject Virginia's conceal carry permits but that hasn't happened yet. Gov: Instead of petty temper tantrums - What are lawmakers doing for kids? What are you doing to create jobs? Gov: Roush has said she wouldn't go back to Fairfax court if she's ousted from the state Supreme Court by Republican lawmakers. Gov. Outside the Beltway is a $2.1 billion project (dedicated express lanes). Gov: There is no alternative plan to address 66. Gov: I've lived in NoVa for 25 years. I understand the problems. If don't do inside, outside Beltway becomes much more expensive and will draw funds from other parts of the state. Gov: There are some Democrats who have said they don't want tolls. Fine. But don't expect me to bail you out. Gov: We've got to move folks through this corridor. Not doing anything isn't an option. On vetoing 66 tolls - Local legislators won't to vote against it and hope that I'll veto it as political cover. I"m not playing that game. If they vote against it they are voting against doing any improvements to 66. The money will go elsewhere. On 66 tolls inside the Beltway: Just widening inside the Beltway doesn't solve any problems. Gov: I have a plan for I-66 - It is the most congested region in America and this is the most congested road in that region. People cannot spend 2 hours stuck in traffic going from Haymarket to 495. McAuliffe: It was fine coming up from Richmond, but coming through the city (District) was just gridlock. Governor, stuck in traffic, called in to @WTOP from his car: "I will be your man on the road today. I'll be your traffic man." McAuliffe doesn't know whether more equipment would have helped with the inordinate amount of snow the state saw. The state has $202 million for snow removal. Virginia is in charge of clearing 58,000 miles. Independent cities handle their own plowing. Virginia has 9,500 people working on snow removal. Virginia has requested emergency assistance from the federal government. This may be either the most expensive or the second most expensive storm in Virginia's history. McAuliffe says the main roads are open after the blizzard. Crews are still working to clear them. Gov. Terry McAuliffe is stuck in traffic. The show started with him from his vehicle on the way to WTOP. @WTOP Please ask the @GovernorVA if he has ever taken #wmata during rush hour. Thanks.